Bake a sheet cake the size that you need. With an icing filled bag and tip# 5 draw the big forty on the cake first. Next draw all the words---Oh No...the, and Four.OH! Now you need to draw the circular lines that make up the background. 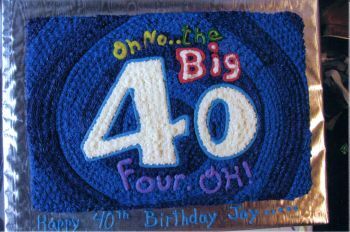 Use a round tip #10 and sky blue icing and outline the big 40. Use a star tip #18 and fill in the 40 with white icing. Use the round tip #10 and red icing and outline the Big. Fill it in with white icing using star tip #18. Using round tip #10 and yellow icing draw the Oh No... With green icing and the same size round tip draw -the. Change to a round tip #5 and yellow icing and draw right on top of the green -the. Now make a lavender icing and use the round tip #10 and draw the Four.OH! Make a royal blue icing and a dark purple icing. Using the royal blue icing and round tip #5 draw the background circular lines. Use the star tip #18 to do the fill in work on the rest of the cake. Now starting at the center of the big 4 start to fill in the royal blue circular line. When you have done this,fill in with the dark purple icing the circular area which is right next to the royal blue circular line. For the sides of the cake just follow the circular pattern from the top to the bottom of the sides.The message is written on the board with sky blue icing and round tip #5. If you have made a 40th Birthday Cake that you would like to share, please submit your cake here and let us know how you made it! We would love to feature your cake on our site. Please make sure to include a photo of your cake and a description of how you made it, so that we can all share ideas and learn from each other!